Use a moist paper towel to clean the mushrooms. Use a spoon to remove the dark part of the interior of the mushroom and the stem. Season each mushroom with salt and pepper, then sprinkle with 2 tablespoons of olive oil. Cook on the open grill for 5 minutes or until soft. Remove from the grill and set aside. Combine the tomato, mozzarella, basic and oregano in a medium bowl. Mix until well combined. Season with salt and pepper to taste and add the rest of the olive oil. 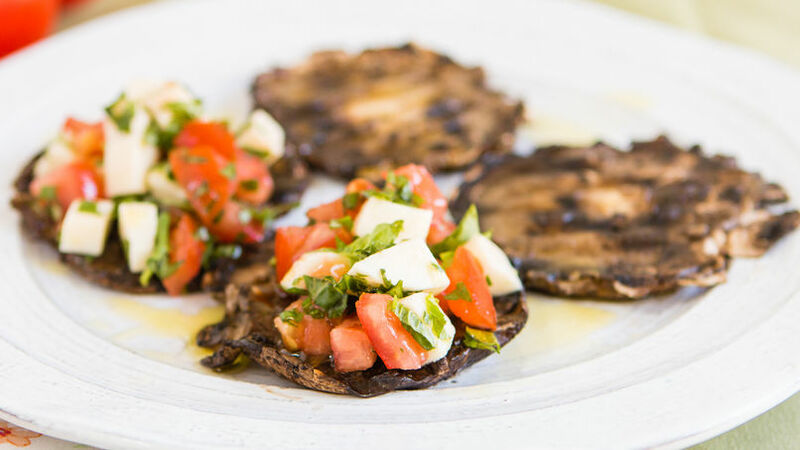 Place approximately two tablespoons of the caprese salad on each mushroom. If you want, after you put the caprese salad on the mushrooms, you can place them under the closed grill for 2 or 3 minutes to allow the cheese to melt. We’re now getting ready to welcome summer and of course this means a lot of grilling, reunions with family and friends, and tons of time outdoors! Even though barbeques traditionally begin on Memorial Day, I have already started planning my menu. Mushrooms are one of my favorite ingredients. I’ve made them in all different kinds of ways. These caprese salad-stuffed mushrooms are delicious. They’re the perfect addition to any grilled meat.